François Stiémart (1680-1740), 'a painter of the Academié Royale' according to Mariette. Boitelle, Paris; his sale, Paris, Jan. 10-1, 1867, lot 199 (1620 francs). Baron de Reuter, Paris; his sale, Christie's, London, July 1, 1899, lot 104 (£1,434 to 'Lord G...'). J. Lassalle; his sale, Hôtel Drouot, Paris, Dec. 16-9, 1901 (=1st day), lot 24. Eugène Kraemer; his sale, Galerie Georges Petit, Paris, April 28-9, 1913 (=1st day), lot 69 (42,600 francs to Jonas). Private collection, South America (from 1913), and by descent to the present owners. E. and J. de Goncourt, L'Art du Dix-Huitième Siècle, 1881, p. 149. E.H. Zimmermann, Classiques de l'Art: Watteau, 1912, p. 17, illustrated. E. Dacier, J. Hérold and A. Vuaflart, Jean de Jullienne et les Graveurs de Watteau au XVIIIe Siècle, I, 1921-9, p. 181; II, pp. 51, 65, 94, 96, 122, 130 and 162; III, no. 262. L. Réau, Watteau, in L. Dimier, Peintres Français du XVIIIe Siècle, 1928, I, no. 78. H. Adhémar, Watteau, sa vie, son oeuvre, 1950, p. 39, no. 133 as datable to 1716. J. Mathey, Antoine Watteau. Peintures Réapparues, 1959, p. 66, as datable to circa 1707-8. J. Ferré, Watteau, 1972, I, pp. 93, 189, 192, 212, 277 and under the years 1867 and 1899; II, p. 510; III, p. 985, no. B44. E. Camesasca and P. Rosenberg, Tout l'Oeuvre Peint de Watteau, 1982, no. 93 as datable c.1712. M. Roland Michel, Tout Watteau, 1982, no. 131 as dated 'c.1714?'. D. Posner, Antoine Watteau, 1984, p. 279, note 24. M. Morgan Grasselli and P. Rosenberg, Watteau 1684-1721, in the catalogue of the exhibition, Washington, National Gallery of Art, Paris, Galeries Nationales du Grand Palais, and Berlin, Schloss Charlottenburg, 1984-5, p. 79, under no. D18; p. 268, under no. P11; and p. 300, under no. P24 ('The Musette, the original of which cannot be traced after the Kraemer sale of 28-9 April 1913...'). M. Morgan Grasselli, The Drawings of Antoine Watteau: Stylistic Development and Problems of Chronology, unpublished doctoral dissertation, Harvard University, 1987, I, pp. 173-5, 182, 455-6; II, nos. 64 and 91. P. Rosenberg and L.-A. Prat, Antoine Watteau 1684-1721. Catalogue Raisonné des Dessins, 1996, I, pp. 166-7, under no. 104; pp. 218-9, under no. 137; pp. 292-3, under no. 185. London, Art Gallery of the Corporation of London, Exhibition of a Selection of Works by French and English Painters of the Eighteenth Century, no. 127 (lent by Kraemer). The rediscovery of a fête galante by Watteau -- inaccessible to the public and scholars alike since 1913 -- is a significant event. The whereabouts of La Musette was unknown at the time of the great exhibition held to mark the tricentenary of Watteau's birth and, until now, only a poor quality black and white photograph published in the catalogue of the Kraemer sale has been available for study. La Musette was engraved sometime before 1729 by J. Moyreau for inclusion in the Recueil Jullienne, the publication by Watteau's friend, the collector Jean de Jullienne, of engravings of the complete corpus of Watteau's art; the volumes of prints after his paintings (two volumes, 1735) are perhaps the first catalogue complet of a contemporary artist's oeuvre. The painting's title is inscribed beneath the image and refers to the bagpipes which provide the musical accompaniment to the central couple, who are about to dance. Another inscription identifies the owner of the painting, a 'M. Stiemar' whom Mariette described as a 'peintre, de l'Academie royale.' François Stiémart (Douai 1680-1740 Paris) was a minor painter, received into the Academy in 1720, who worked principally as a copyist. He is primarily remembered as François Lemoyne's brother-in-law, and it was perhaps through Lemoyne that he would have met Watteau. It is interesting to note, however, that while Watteau seems to have been patronized only rarely by the aristocracy (the Comtesse de Verrue, is an example), and ocassionally by the wealthy financial class (Crozat), a significant number of his pictures were owned by fellow artists; Massé, Liotard and Oppenord, among others, had pictures by Watteau. Watteau's works are not dated and a chronology of his paintings is still difficult to establish. 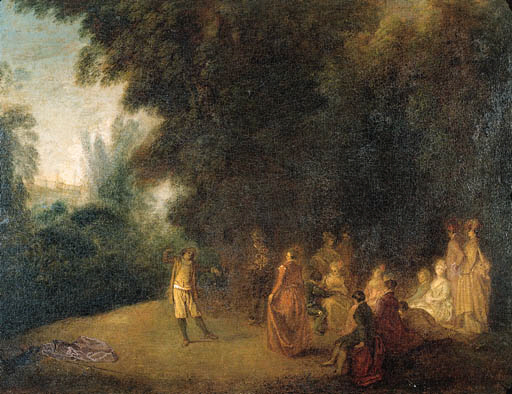 However, sometime around 1712, Watteau developed the original genre of painting with which his name would henceforth be inseparable: the fête galante, a fanciful union of landscape and elegant figures engaged in the various stages of romance. He brought to this seemingly transparent and decorative genre a timeless psychological richness, humor, humanity and mystery that would elude his copyists and imitators. La Musette has been assigned a wide variety of dates, from 1707 to 1716, but on direct examination it is apparent that the picture is a fairly early essay in the genre, probably painted around 1712-13. The figures are slightly stiff and elongated and less seamlessly integrated into the whole than they would be in later paintings, such as La Perspective (Museum of Fine Arts, Boston). Only one preparatory drawing is known for La Musette, a sheet of seven red chalk figure studies in the Musée des Beaux-Arts, Dijon (Grasselli and Rosenberg, op. cit., no. D18) that includes sketches of the seated woman seen from behind and the standing gentleman in lost profile on the right of the canvas. Grasselli, Rosenberg and Prat all date the drawing to 1711-12. The group of figures for which this sheet is preparatory must have pleased Watteau, for he transplanted it, virtually without change, into two other paintings of the same period. One of these, probably the earliest of the three, is The Village Bride in Schloss Charlottenburg (ibid., no. P11); the other is the unusually large (96 x 128cm.) Country Ball in the Noailles Collection, Paris (ibid., no. P24), which probably dates from as much as a year after La Musette. The Country Ball is a virtual reprise of La Musette en large, and their close similarities may account for its not having been engraved for the Recueil Jullienne. As the musette-player begins his song and friends gather in a lush garden to watch, a man and woman pause momentarily before abandoning themselves to the dance. For Edmond and Jules de Goncourt, Watteau was an artist of Shakespearean compassion, his Cythera a place of midsummer night's dreaming. '...Beneath the laughter of [Watteau's art]', they wrote, 'there mumurs an indefinable harmony, slow and ambiguous; throughout his fêtes galantes there penetrates an indefinable sadness; and like the enchantment of Venice, there is audible an indefinable poetry, veiled and sighing, whose soft converse captivates our spirits'.